Sibuxiang: They're telling us their names. Taikoubou: That means they're more than just ordinary demon immortals! The Game of Kings begins a serious, new phase of Soul Hunter. 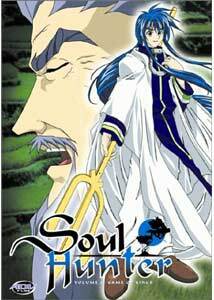 Taikoubou is now a military assistant to Ki Shou and although this might seem a violation of his original Project Soul Hunt orders, he feels it's the best course of action. Ki Shou worries about relying on immortals for help against the evils with in the Yin Empire. Bunchu, still out to set things right his own way, has taken a drastic new step; now he's enlisted his own demon immortals for help. Taikoubou and his friends don't know it yet, but they're in for quite a beating when these immortals show up. Dakki, the demoness controlling the Yin Empire, has now positioned everyone where she wants them. She intends to start a much larger war and is essentially playing with everyone. This is the theme that disc 4 in the series runs with, and it certainly complicates things, even more so than previous storylines. Now that there are evil immortals teaming up against Taikoubou, their victory is seriously in question. They'll also have to work together more efficiently. At first, I thought adding even more characters to the cast would be a bad idea and potentially sink things, but it works very well. It certainly gives the "good guy" immortals more to do and makes them slightly more noble characters than simply the goof-offs they typically represent. That's not to say the series' characteristic humor isn't present; it's still filled with jokes and self-referential quips. If there's any downside to where Soul Hunter is heading, it's keeping up with everything. You'll need the supplied relationship trees and glossaries to keep everything straight. Since so much of the series has to remain in Japanese, the terms can get a bit overwhelming, as will all the members of royalty. I suppose some people might not like the mixing of history with all this fiction, but it's in good spirit and is handled respectfully. With all this in mind, Soul Hunter feels like it's heading into the final episodes. Could the next disc be the last? We shall see. Image Transfer Review: Typically schizophrenic of Soul Hunter, some of this disc (including entire episodes) is computer-enhanced animation (extremely clear, crisp, and cel-perfect), while a few scenes are hand drawn and use a much grainier source. The division between the two isn't as jarring and sudden as it usually is, leading to a much more pleasing disc. While the sharpness leads to a few instances of aliasing and moiré patterns (especially 'rainbowing' around sharp edges), it's an excellent transfer. Audio Transfer Review: The Japanese and English 2.0 audio nicely compliments the on-screen action and all the activity of the immortal folks. Stereo effects are used well, and most of the show is rooted into the center channel with other left/right material framing it well. The English dub seems to be weakening a bit, and I noticed a few odd places where the humor in the dub goes a bit further than the Japanese, undermining some of the dignity. Extras Review: The included supplements feature the usual text-based documents offered to help viewers get all the characters straight as well as the foreign terms. There is a small gallery of stills, and more translation notes in the keepcase insert. ADV previews include New Kigamure Orange Road, Princess Nine, Original Dirty Pair, Sakura Diaries, Burn-Up Excess, and Excel Saga. Another solid edition of Soul Hunter is offered here. A series well worth casually enjoying, as it doesn't take itself seriously enough to inspire the viewer to do so.